strength lies in its attached mechanical saws. the flesh of beasts into fine shreds. The Whirligig Saw requires 18 strength and 12 skill to use. Though it requires a high investment in strength, this will not be wasted, as it scales exceptionally well with this stat. It even receives an S rating when fully upgraded! 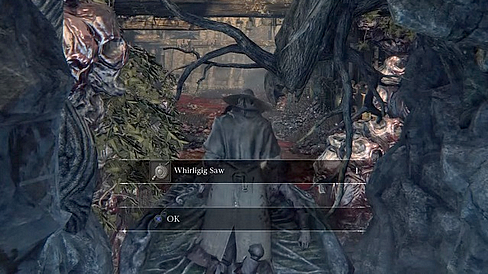 Many attacks in normal mode offset the Whirligig Saw's scaling by having low damage multipliers. The real star of the show is the transform mode, which rapidly shreds with some attacks. In addition, this mode deals a 20% damage increase against enemies weak to serration. Both modes utilize the game's regain system very well. 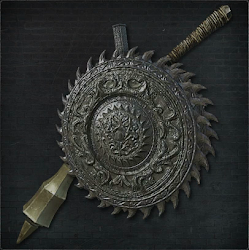 All things considered, the Whirligig Saw should feel comfortable to anyone familiar with Logarius' Wheel. Normal Mode: For the most part, damage multipliers for normal mode attacks score lower than the weapon's overall attack rating. Attacks are mainly blunt, but there are a few thrust attacks at your disposal. You may want to use this mode for its speed and comparatively lower stamina costs, especially when handling more evasive enemies. Transformed Mode: The Whirligig Saw's transform mode uses a large array of physical attacks, which is a good balance to all of the blunt and thrust attacks of the normal mode. This mode is overall slower and consumes more stamina, but deals more damage per hit. It also gains a 20% attack bonus against enemies weak to serrated weapons. This mode is similar to Logarius' Wheel with its shredding attacks; players utilizing the regain system will benefit greatly from using this mode. Normal: Treasure in Hunter's Nightmare, just after Nightmare Church lamp. You head down the stairs, drop down to your right and a little further up it will be on the tombstone. The Whirligig Saw scales quite well with arcane, making it a good candidate for damage conversion with the use of elemental effect gems. That being said if you can go with the physical damage type, it should be your first choice. Since the transform mode deals extra damage against enemies weak to serration, you may want to convert its damage to fire, another common weaknesses among beasts. Adept (blunt) effect gems can be used to boost the damage of most the normal mode's attacks. This is a good option considering their generally low damage multipliers. You may also want to take advantage of the faster swing speeds of the normal mode, and rapid shredding of the transformed mode by slotting Dirty and Murky gems. These attacks will build up poison very quickly, making the Whirligig Saw one of the best weapons you can use for this purpose. For more information check the Best Blood Gem Setups page. Normal Mode: The R1 chain is a series of fast blows and, while not exactly rapid, their speed will somewhat make up for the low damage multipliers. Blunt attacks receive higher rates of health regain, which synergizes well with the speed of these attacks and more aggressive play. The fourth hit of this chain is thrust type, though its usefulness can be quite limited due it to being so late in the chain. The backstep R1 makes for a better and more useful thrust attack. Its damage multiplier low, but it uses much less stamina than the dashing R1 thrust. Backsteps won't put much distance between you and the range of most enemy attacks, if at all. They also require specific timing to properly utilize the invincibility frames, so in some cases the dashing R1's higher stamina may be worth it. The normal R2 has much better damage than most attacks, but you're better off just using the transform mode R1s for faster swing speeds and similar damage. A charged R2 will deal much more damage than other attacks, but it's really only useful for setting up rear visceral attacks. Instead, consider using the leaping R2. This is a great alternative; it uses slightly more stamina, but deals a fairly similar amount of damage without the long charge. It's also great for breaking enemy super armor, which it does with high impact. Transformed Mode: The R1 chain has a good damage multiplier and peaks at the fourth hit with a small area of effect grinding attack. If you manage to pull off the whole thing, it deal a great amount of damage. Otherwise, you can use the first R1 for prodding back enemies. Quickstep R1s are very useful for this purpose as well. Single hits are almost a necessity for some enemies, and for these instances you can use a backward quickstep R1. This gives good forward momentum which is only complimented by the forward jab. A fully charged R2 will take a lot longer than most other weapons' equivalent attacks to perform, but it is very powerful and creates a small, continuous grinding area of effect. If you feel that an enemy is getting too close during the long charge, releasing it early is not a bad idea. Doing so will result in a standard R2, but with its startup out of the way during the charge, the swing will be near instant! This can also work as a strong fake out against players online. Another two grinding attacks are the leaping and backstep R2s; the leaping R2 deals more damage, but the backstep R2 uses less than half the amount of stamina to perform. Holding L2 causes your character to hold the blade outward while it spins. This chips away stamina quickly while active and cancels upon release. You can still slowly move around while doing this, which will allow you to walk into enemies with the blade. Enemies with next to no super armor will be stun locked, unable to attack. Foes with high super armor values will appear to flinch, but can still attack, so don't get too greedy! Tapping L2 also works as a forward jab, though the damage multiplier for a single hit isn't that good by itself. Durability of the weapon depletes when used. This means hitting an enemy, destructible object or bouncing off the walls. Hitting undestructible objects and environment does not deplete your durability. Style of an attack or upgrade of the weapon, even different weapon, does not matter - each count as one hit. Every 10th hit against the enemy/object depletes 1 durability. Exception is Tonitrus, which when in self buffed mode, depletes durability at rate of 2 hits. Hitting an enemy in dying animation still counts as hit. Also hitting multiple enemies/destructible objects at once counts as one hit per enemy - hitting 3 enemies at once counts as 3 hits towards durability counter. Shields lose 1 durability every 10th hit. Bounce means when your hit is bounced back off the wall or other objects. Every 5th bounce depletes 1 durability. Not every weapon can be bounced off, Whirligig Saw belongs into the category which cannot. Damage reduction when heavily worn. When weapon is at 30% of total durability, it reaches the Risk state and AR is reduced by 30% and when it hits 0% of total durability, weapon is Broken, then AR is reduced by 50%. Whirligig Saw which has 230 points of durability reaches risk state at 69 Dur. Workshop's Repair: cost of repair depends on the weapon and its upgrade. 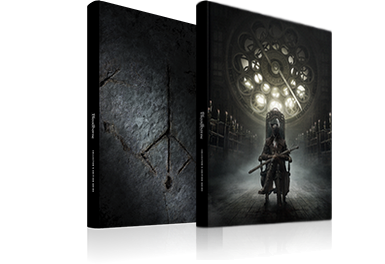 For Whirligig Saw +0 it's 3 Blood Echoes per 1 point and for Whirligig Saw +10 it's 10 (values are rounded), full repair costs for +10 are 2400 Blood Echoes.